Squid belong to a class of mollusks called cephalopods. Squid are an ecological staple in deepwater habitats. Due to the stranding of numerous giant squid along the west coast of Spain in September and October 2001 and October 2003, scientists decided to conduct a study to see if these fatalities could be linked with the proximity of vessels using compressed air guns that produce high intensity and low frequency sound waves. All cephalopods are known to have statocysts that help with navigation and maintaining balance. An experiment was designed to see if different time periods of exposure to low frequency sound waves would inflict damage upon these balloon-shaped structures lined with tiny sensory hair cells that are responsible for sound reception and perception. During the experiment, four different species of cephalopods were exposed to 50-400 Hz of noise that was amplified by in air loud speakers. After different time periods of noise exposure, the organisms were decapitated and their statocysts extracted and examined by a microscope to see any resulting damage, and the outcomes were shocking. Many kinocelia in the hair cells were missing or bent, some hair cells were ejected resulting in spherical holes, and the nerve fibers underneath these structures were swollen. Many of the cells experienced ruptured plasma membranes and mitochondrial damage, if not complete degeneration. All of these lesions and further effects only advanced with the time after exposure (Andre 2011). This means that if there are significant increases in noise levels caused by the operation of offshore energy generating technologies, we will not be able to see the full effects these changes have on cephalopods for months or even years. 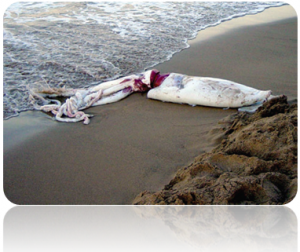 This is a before and after picture of the damage to the cephalopod's hair cells after sound exposure (Andre 2011). As seen from this study, cephalopods are extremely sensitive organisms that require a specific range of noise in order to function properly. There may be significant physical changes and potential fatalities if that range is disturbed by the operation of coastal energy generating devices . As a result, this could cause the alteration of entire food webs, possibly eliminating many of the aquatic or terrestrial species we so heavy rely on for food sources and ecosystem services. Response: Is Banning Plastic Straws a Viable Solution? What are some variations of a surge converter? What are the efficiencies of the devices? What in the future for these devices? How is it better than other renewable technologies?